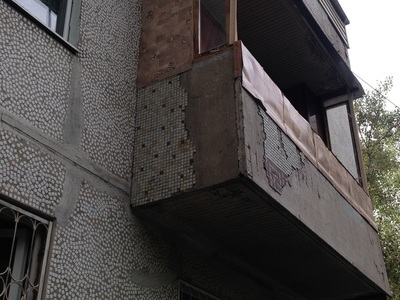 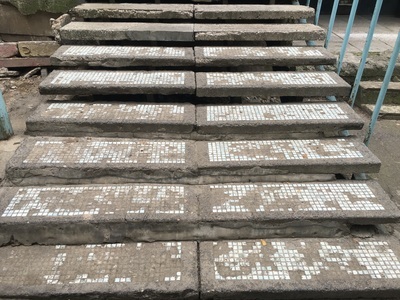 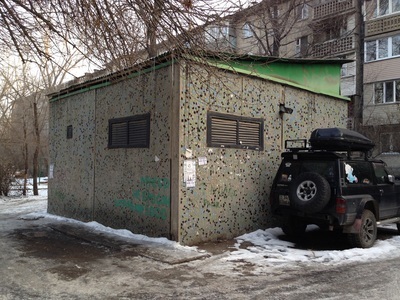 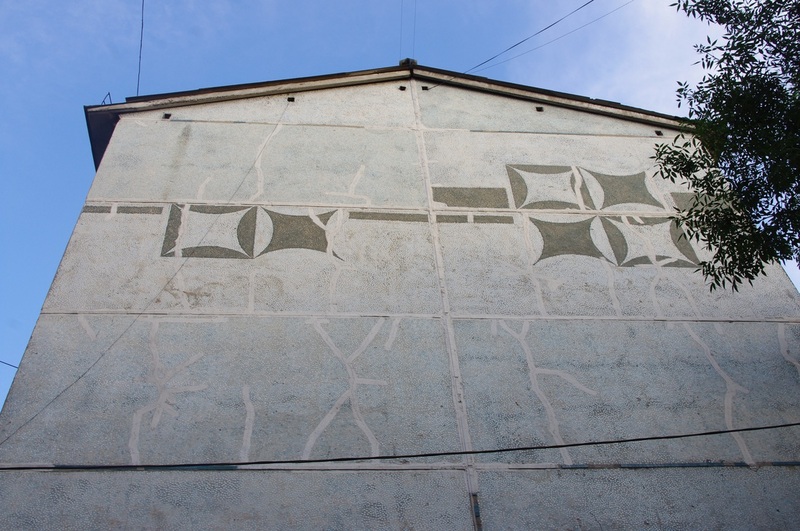 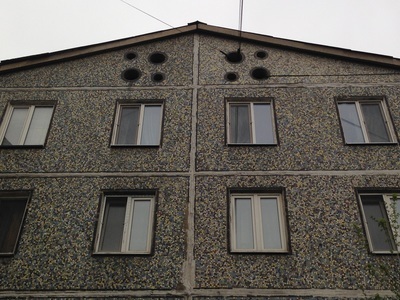 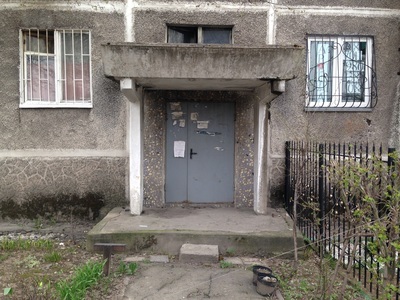 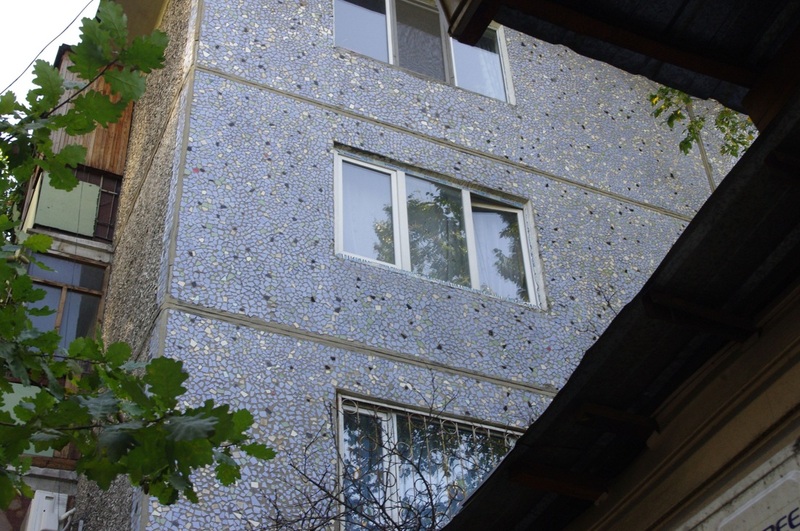 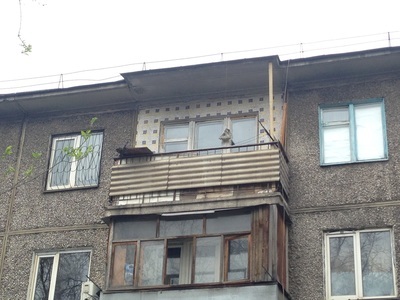 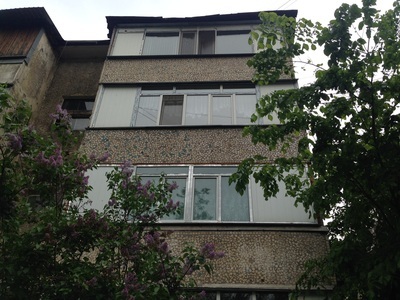 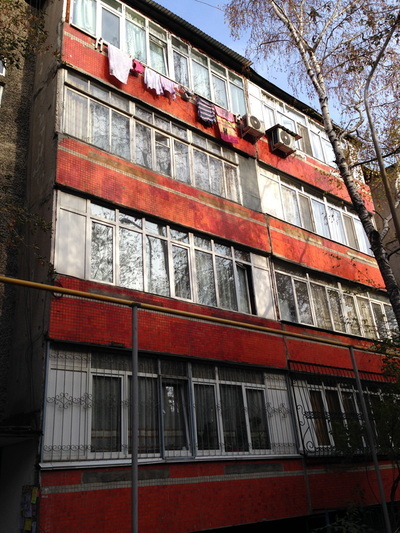 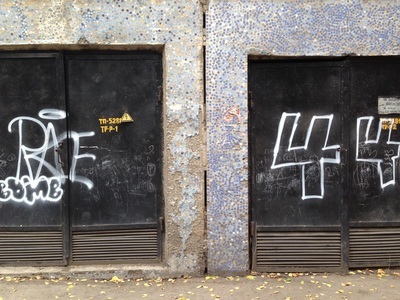 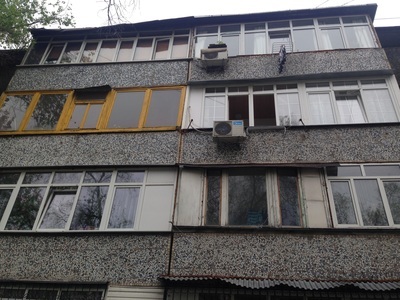 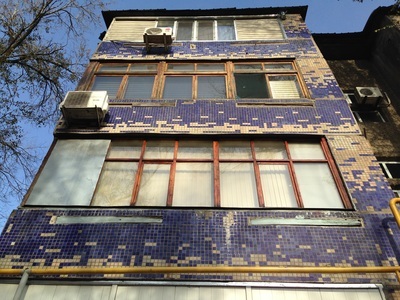 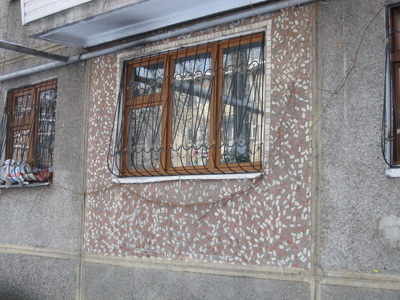 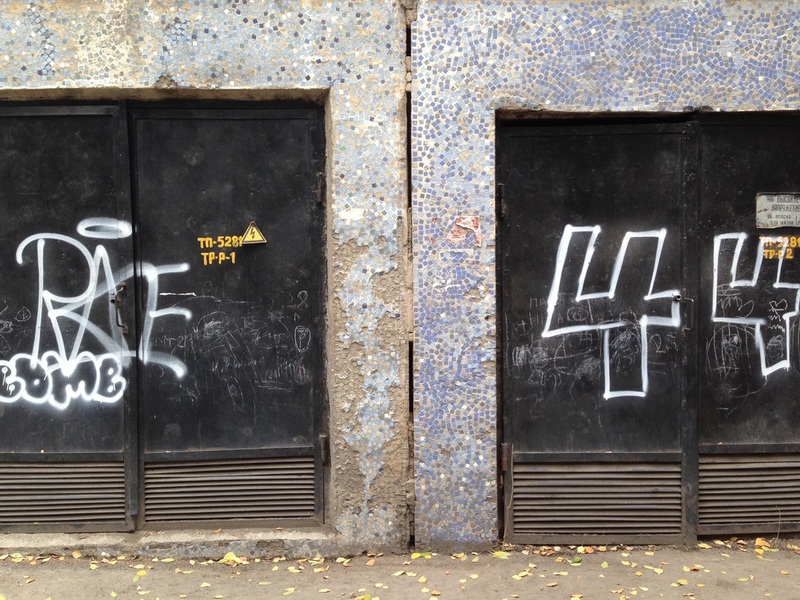 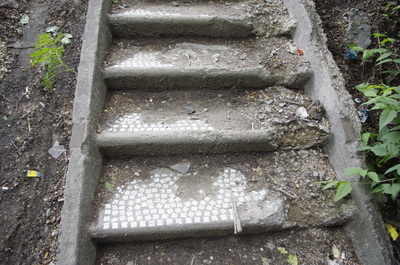 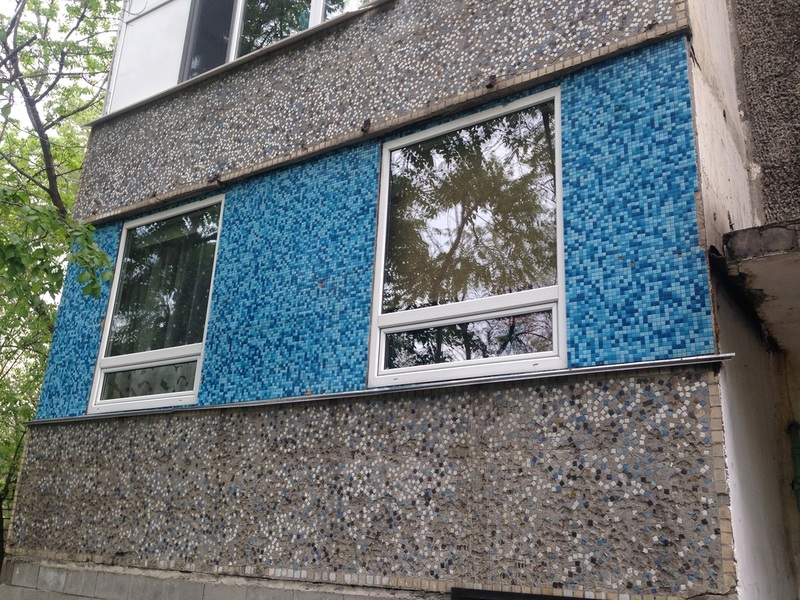 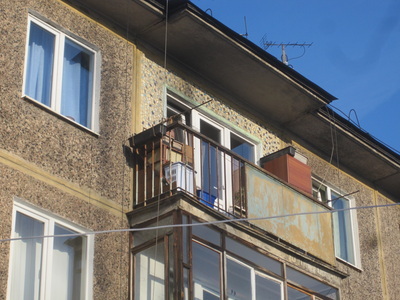 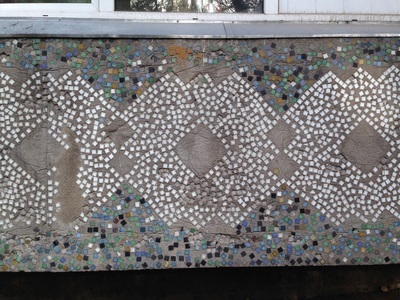 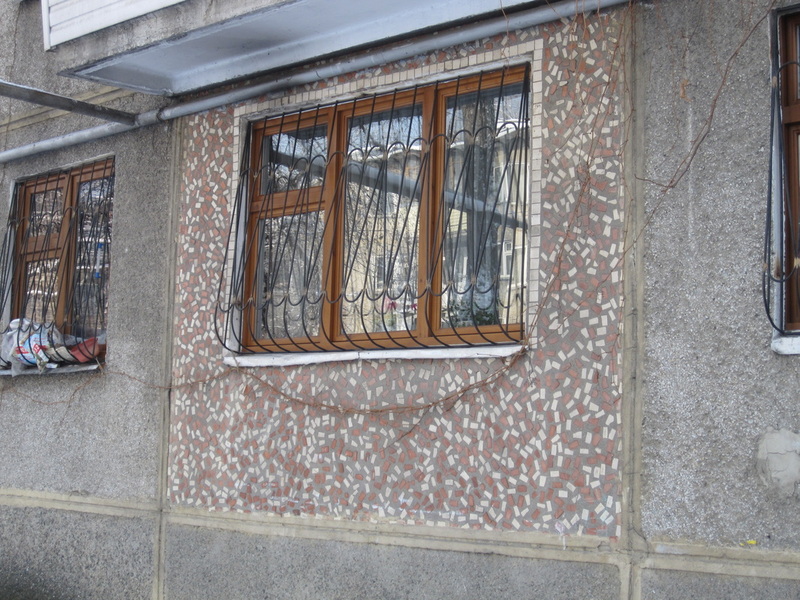 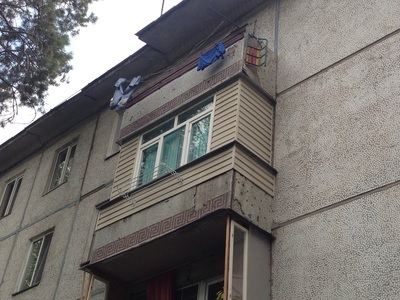 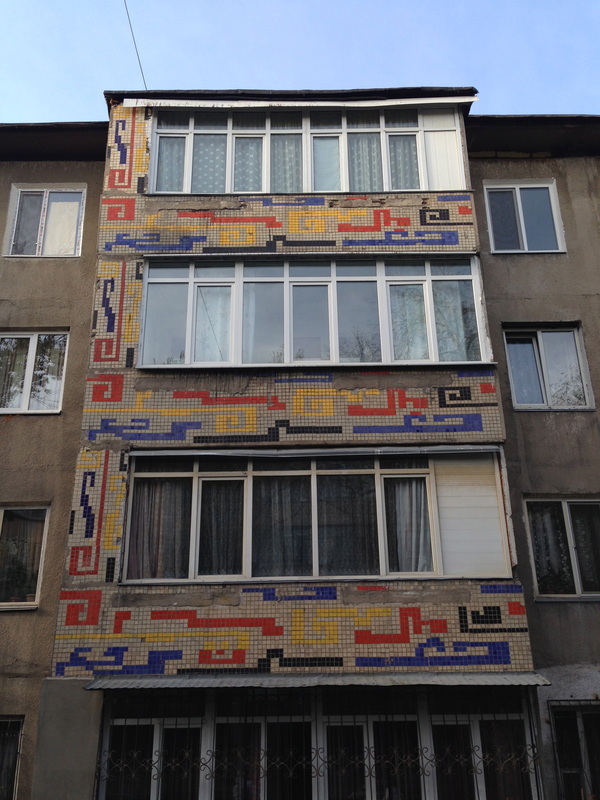 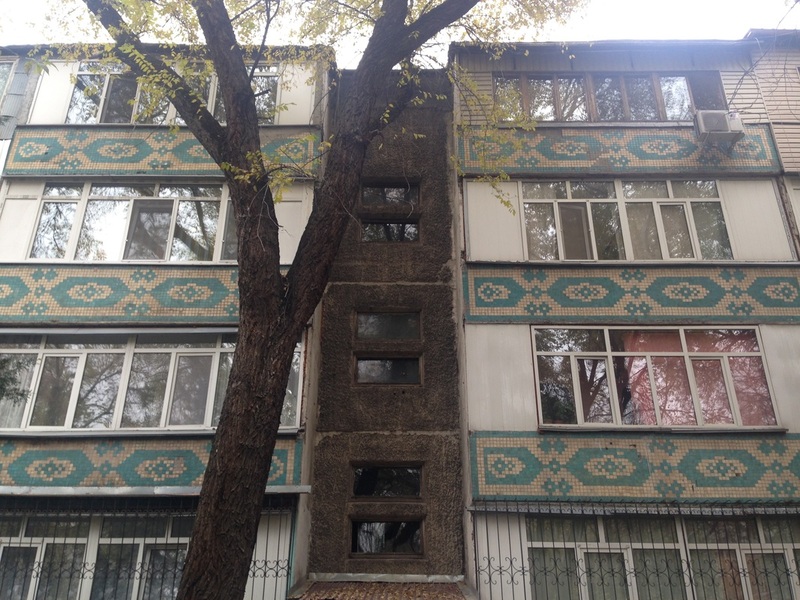 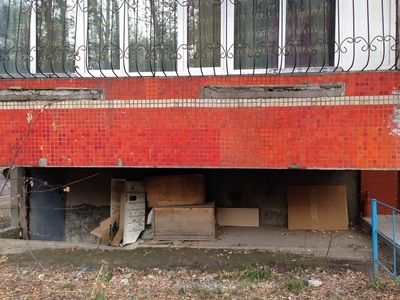 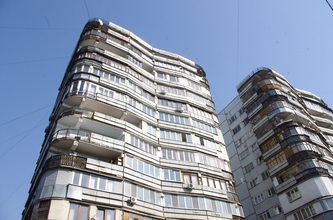 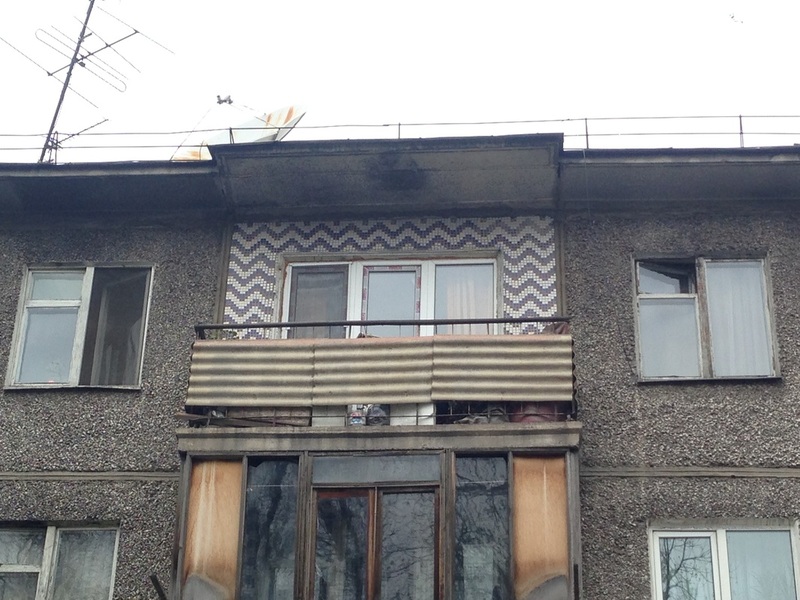 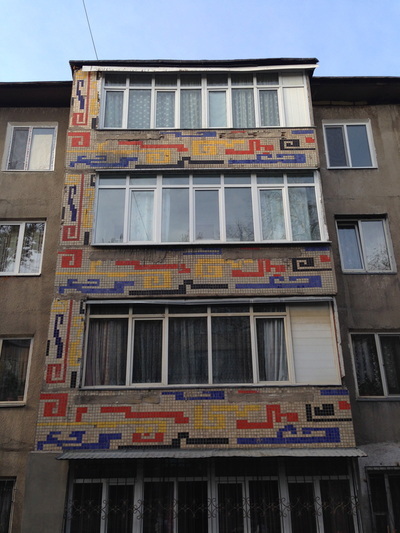 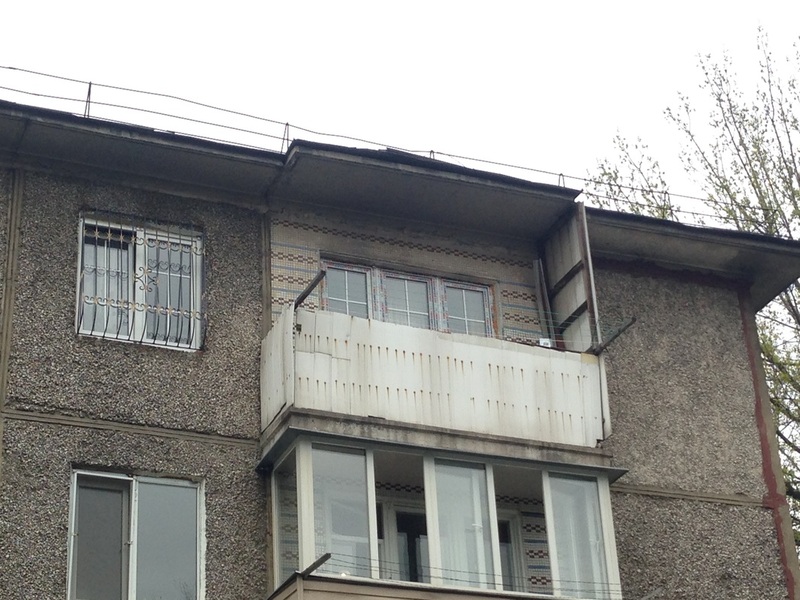 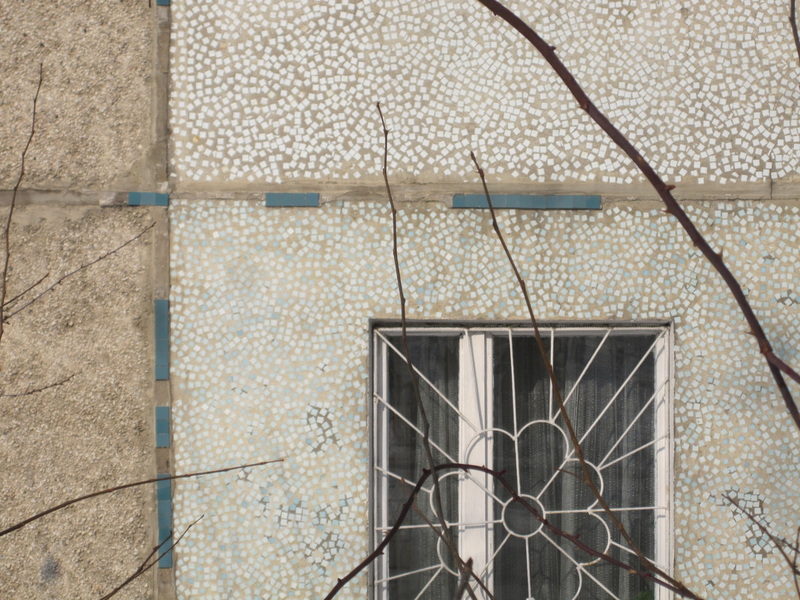 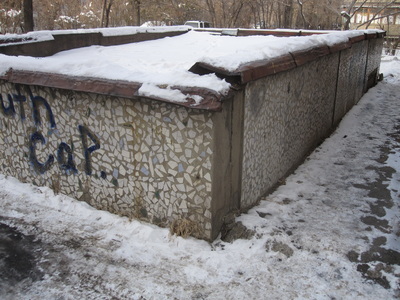 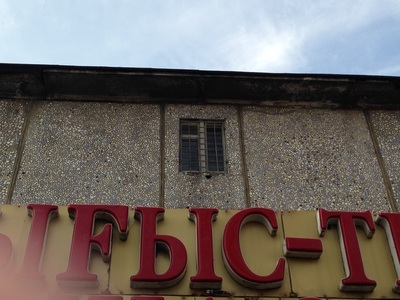 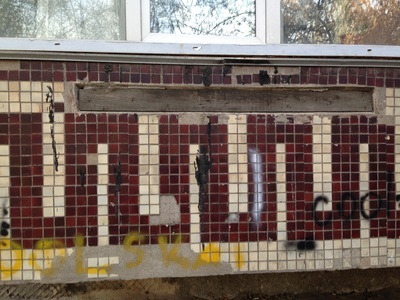 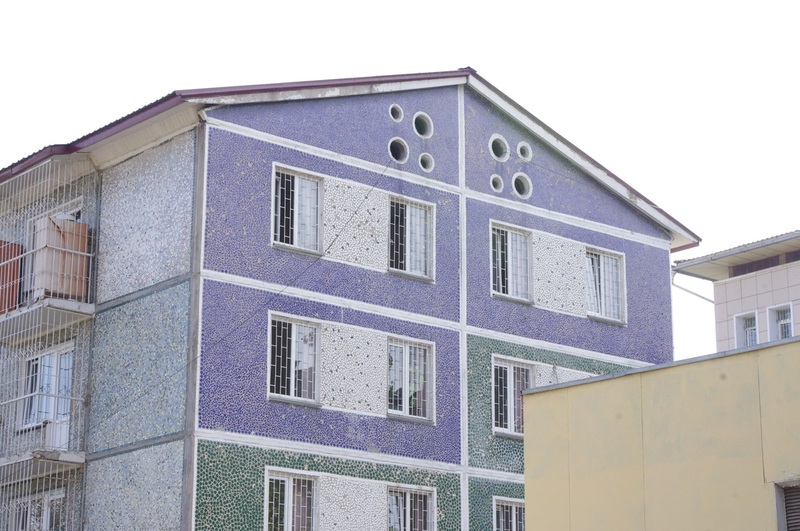 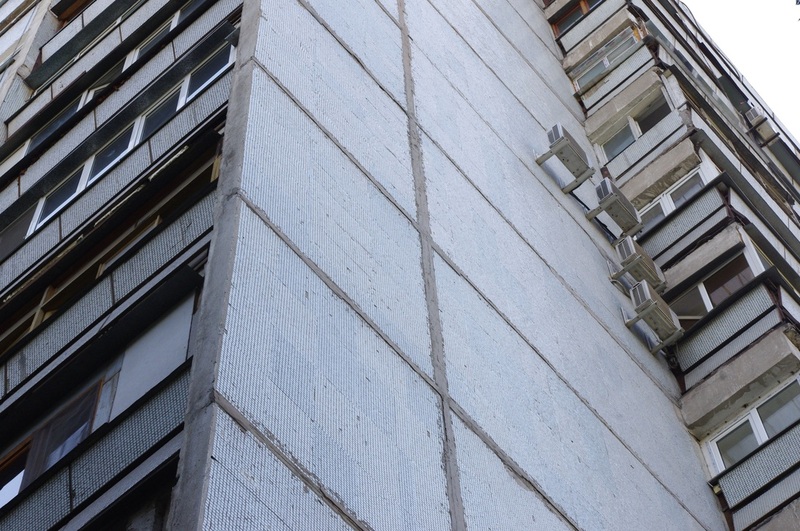 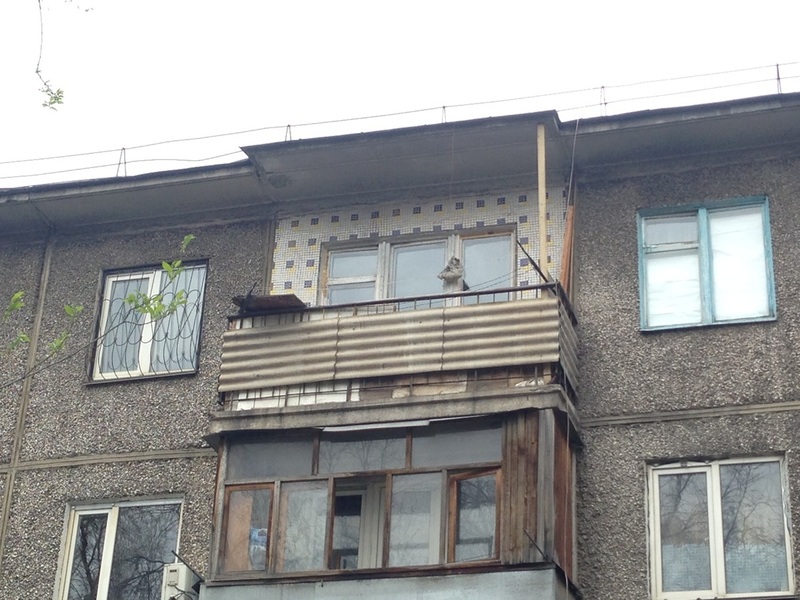 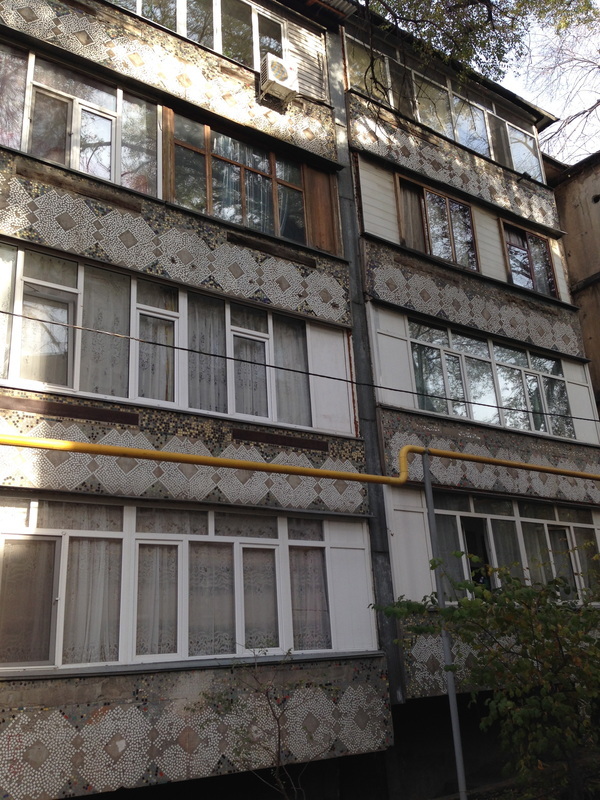 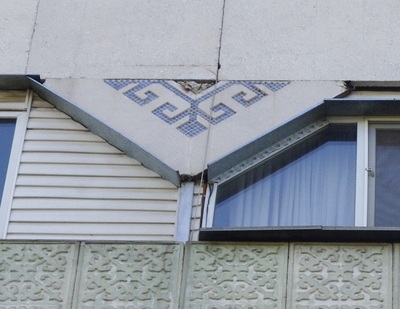 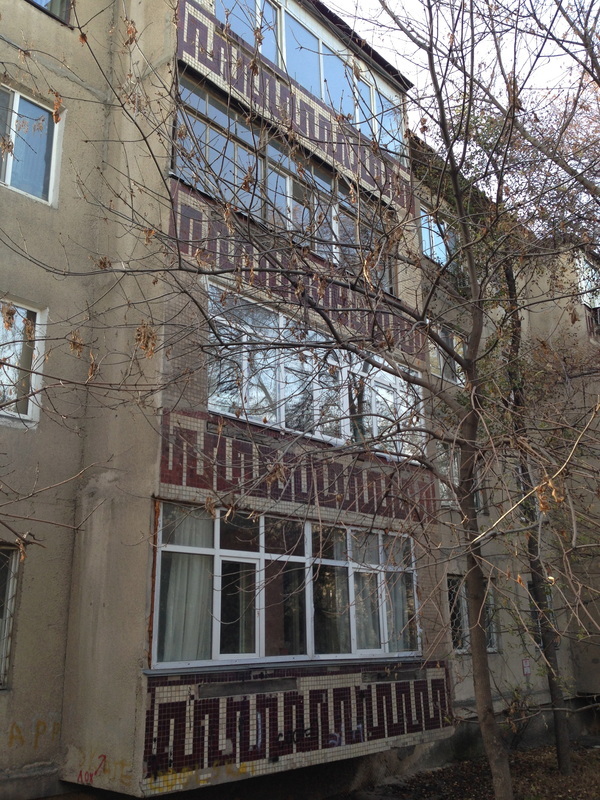 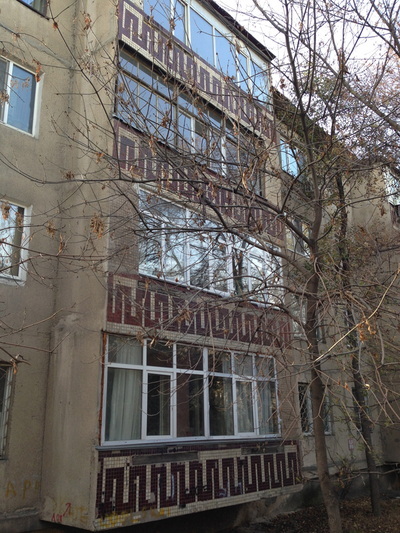 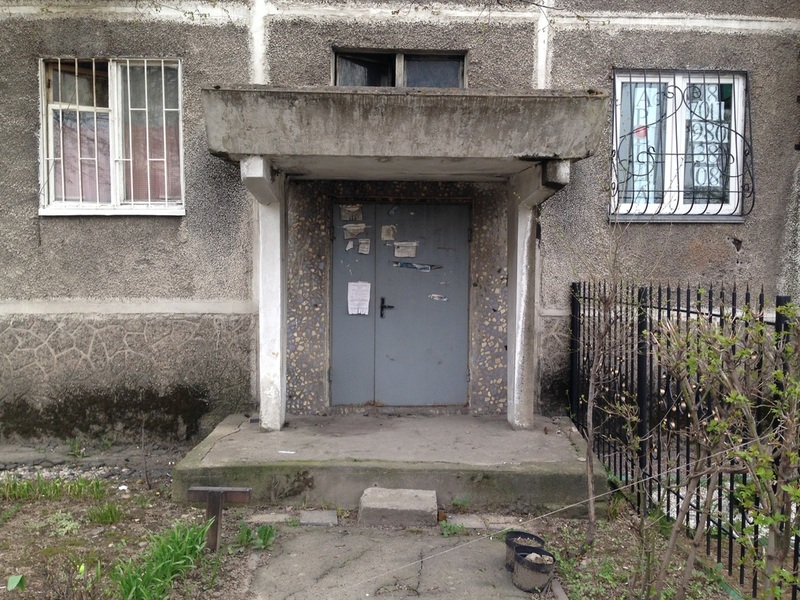 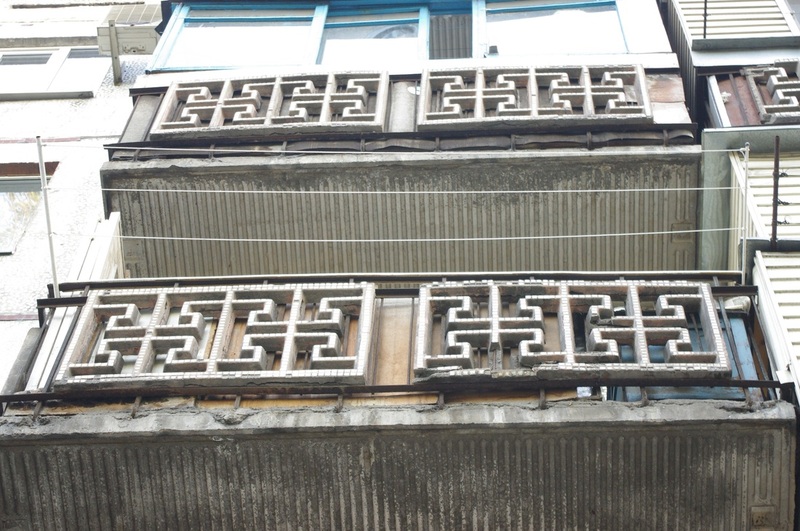 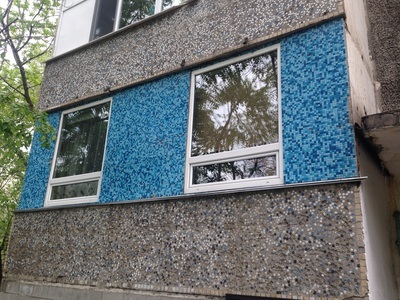 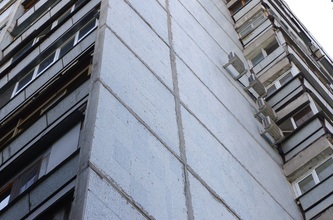 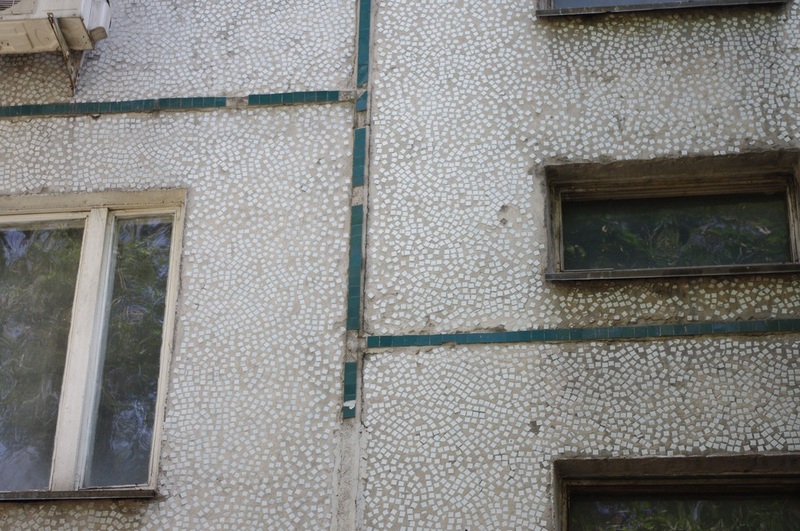 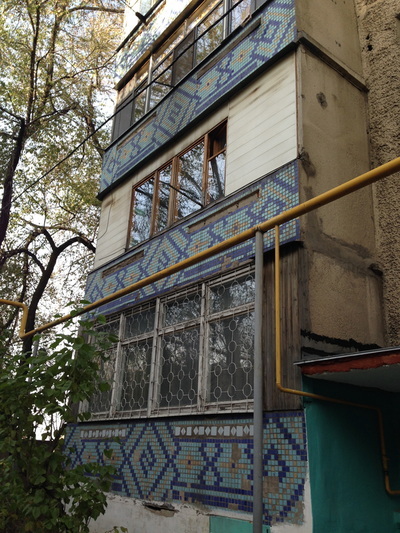 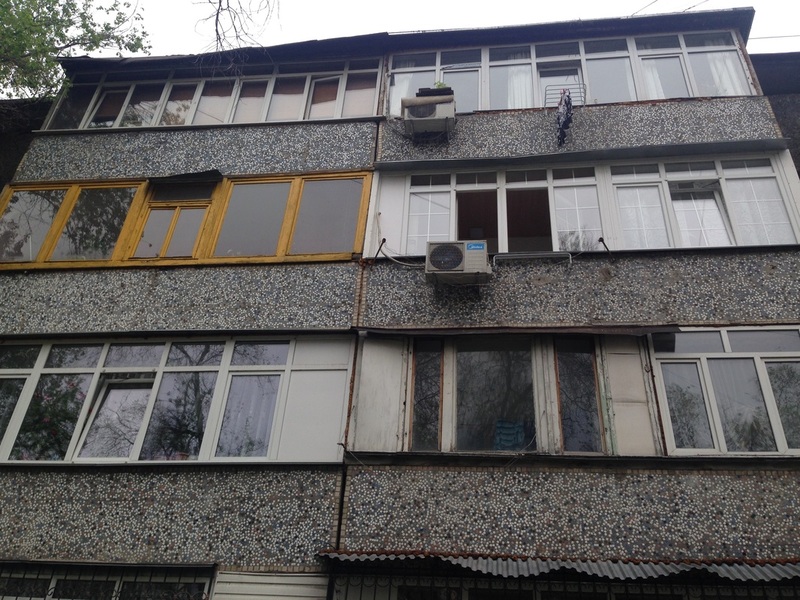 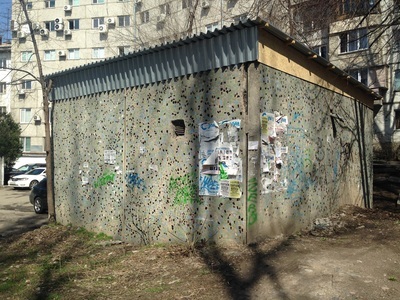 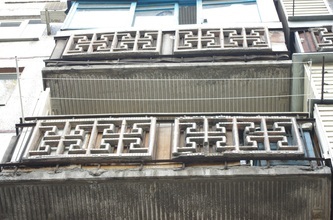 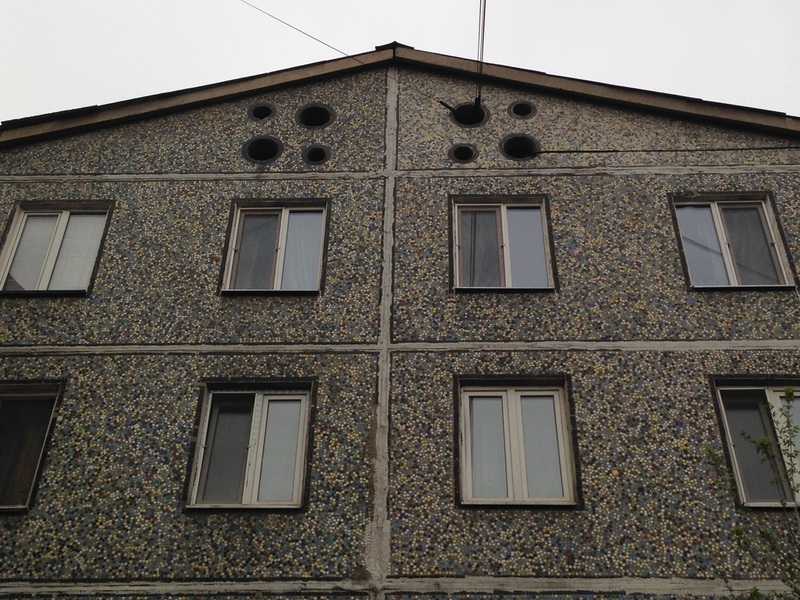 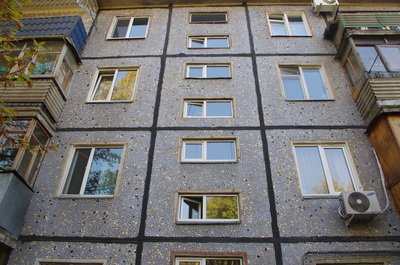 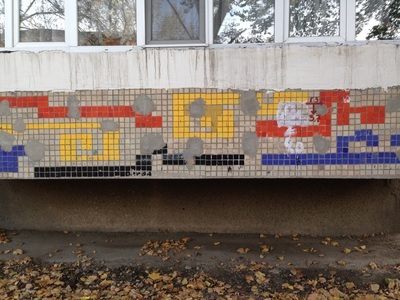 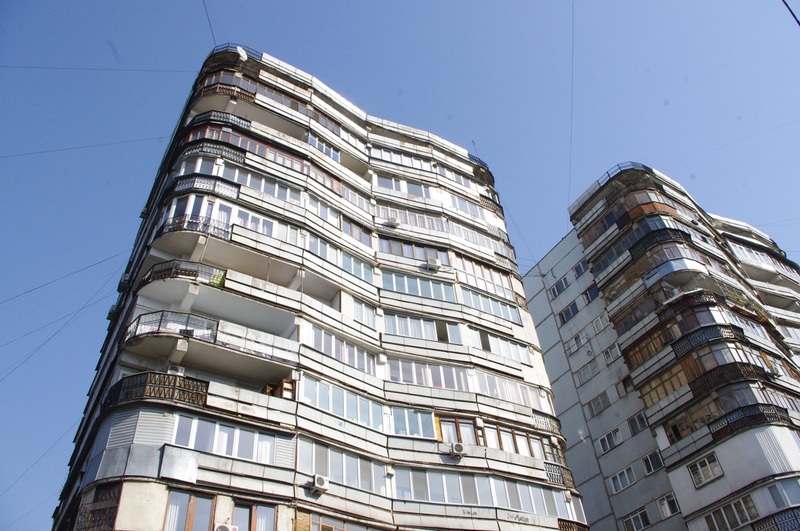 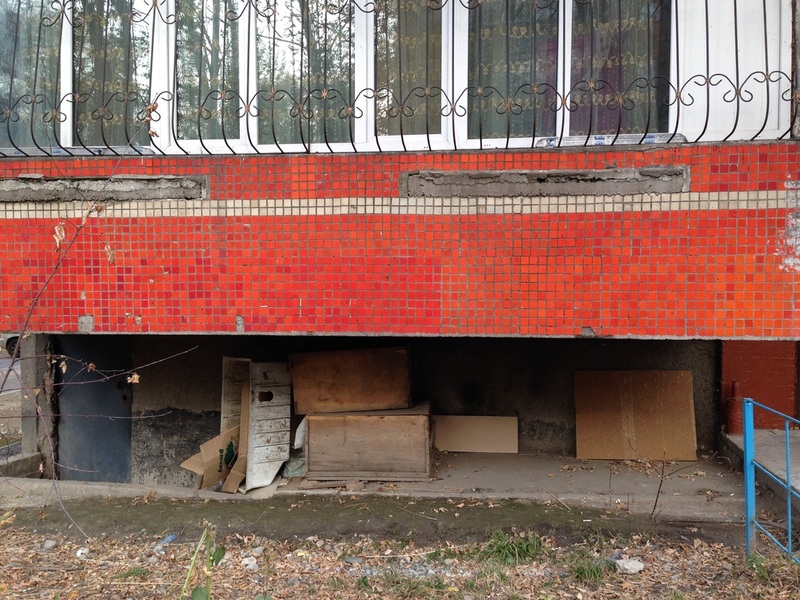 The engineers at the Almaty Homebuilding Plant, where Soviet pre-fab highrises were built in connectable pieces, were not immune to aesthetic considerations. 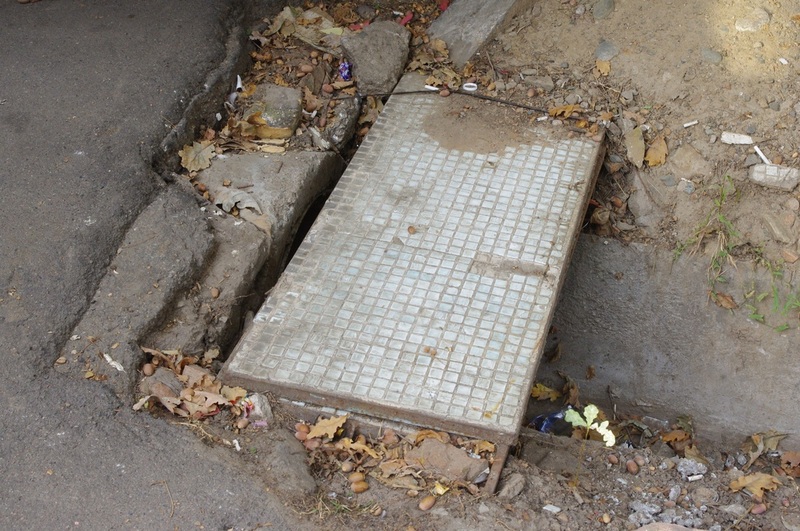 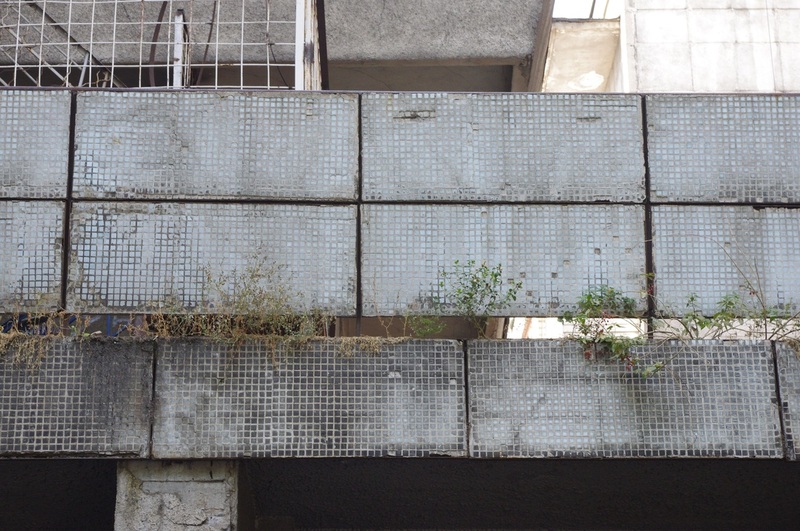 It's self-evident that solid-grey concrete slabs are not attractive, not to say uninspiring for the proletariat masses. 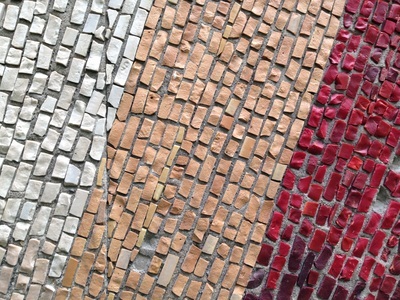 Why not add a little color? 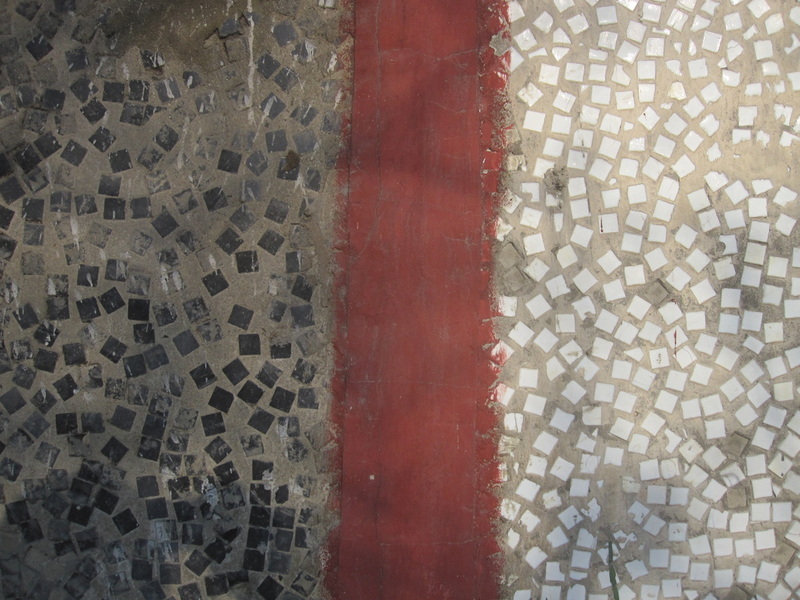 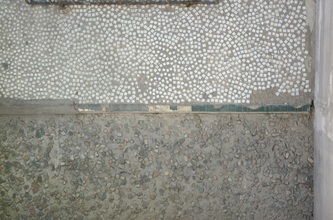 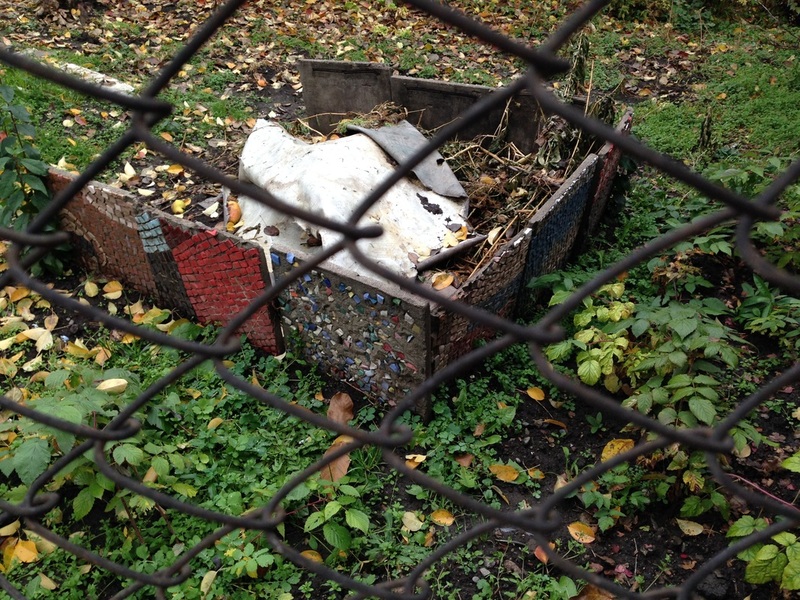 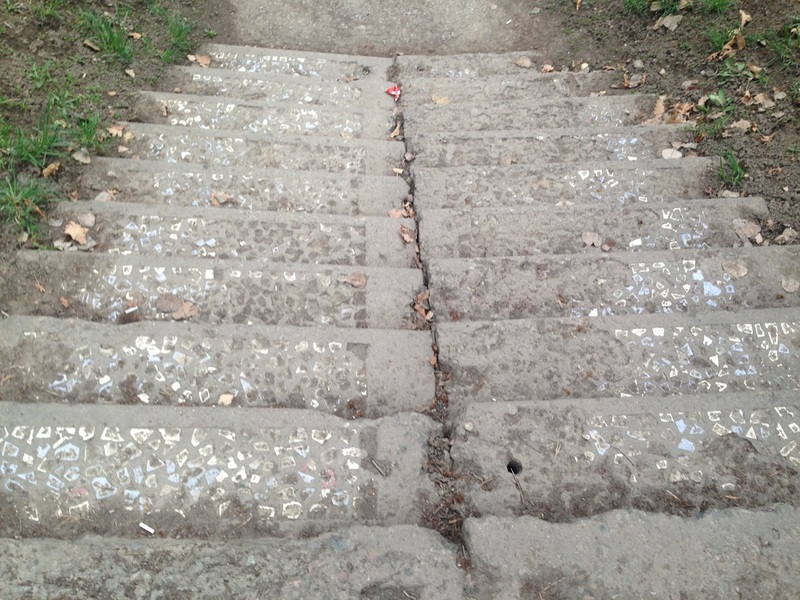 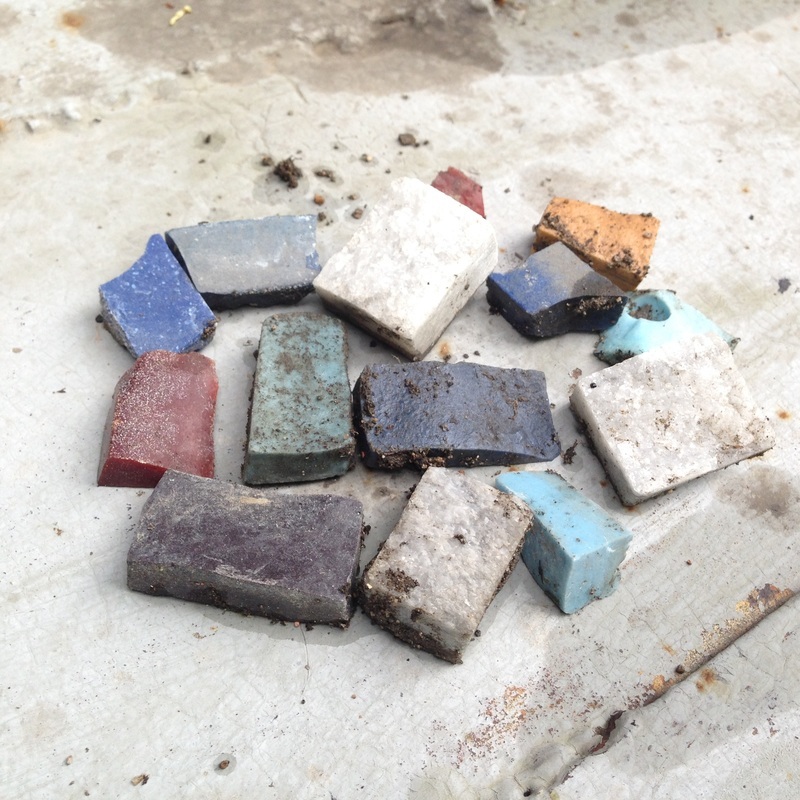 Paint on concrete, however, has a limited lifespan. 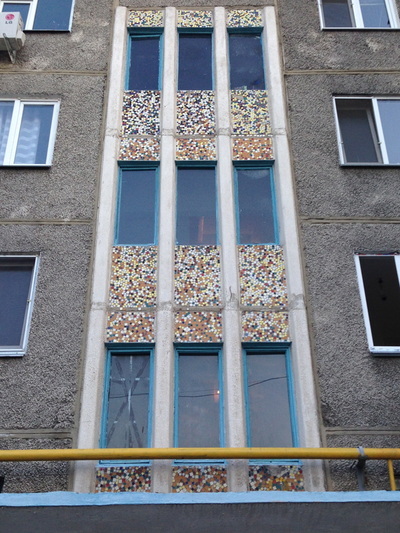 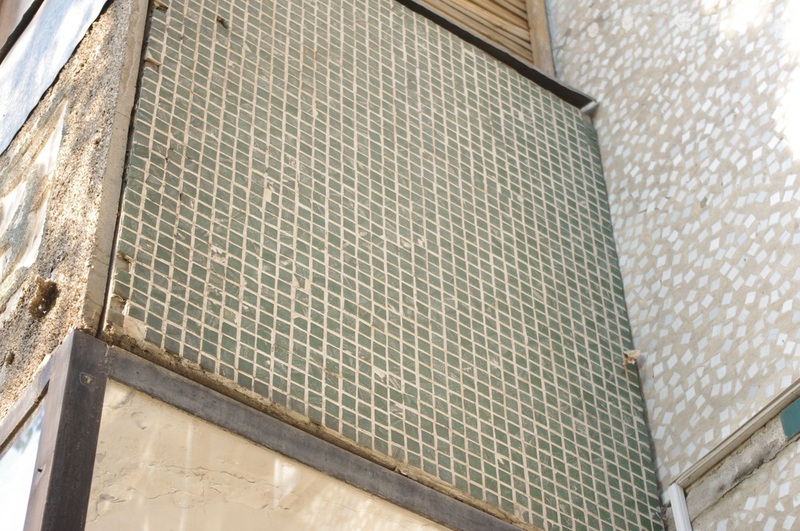 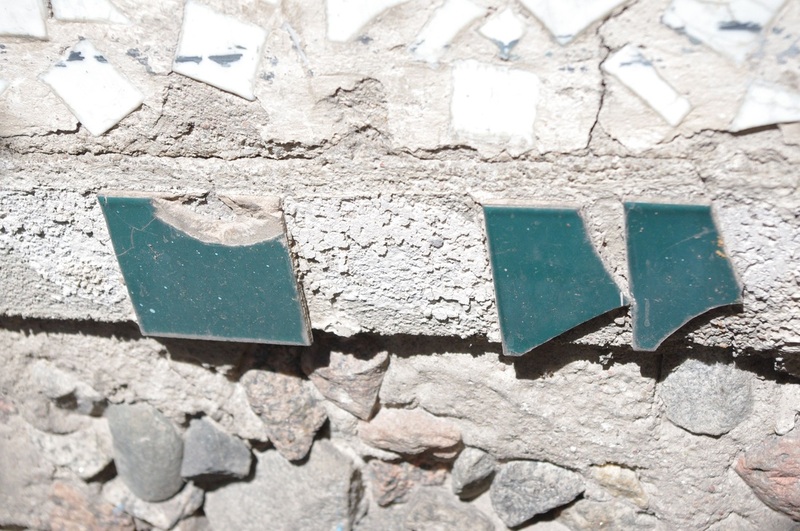 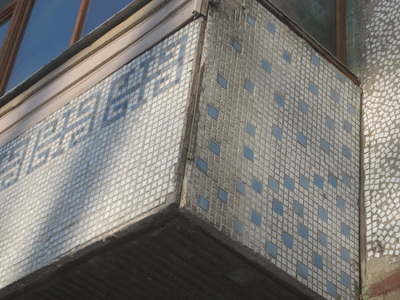 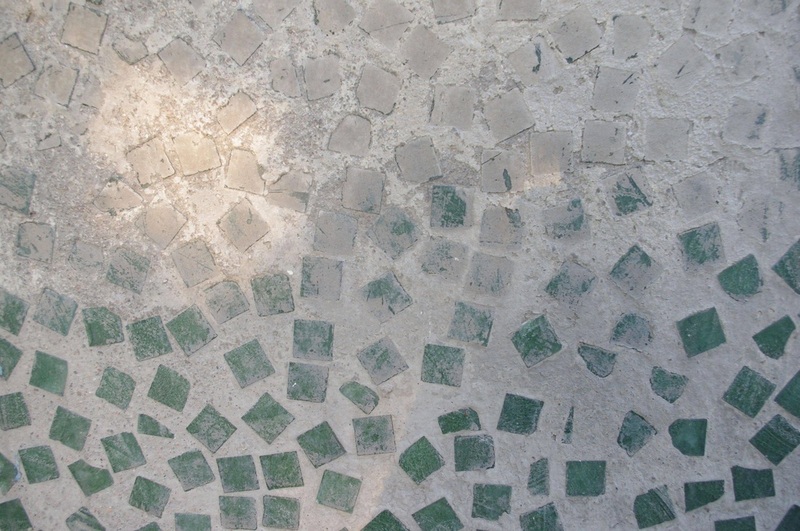 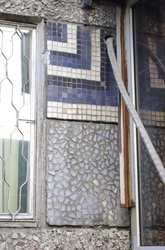 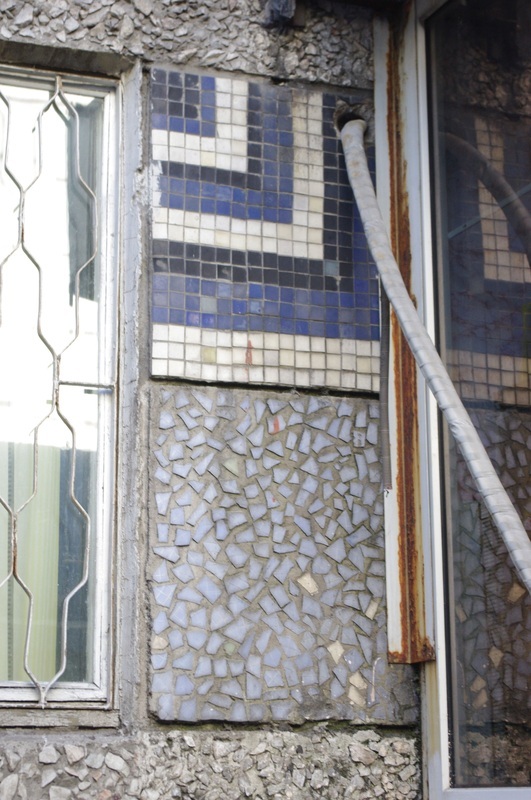 What the engineers discovered was that glazed colored glass, called smalta [смальта] the very same material used to make socialist mosaics, could be used to brighten up a facade as well. 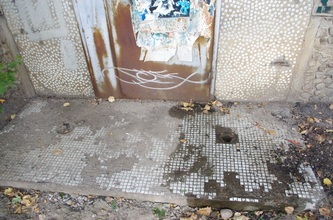 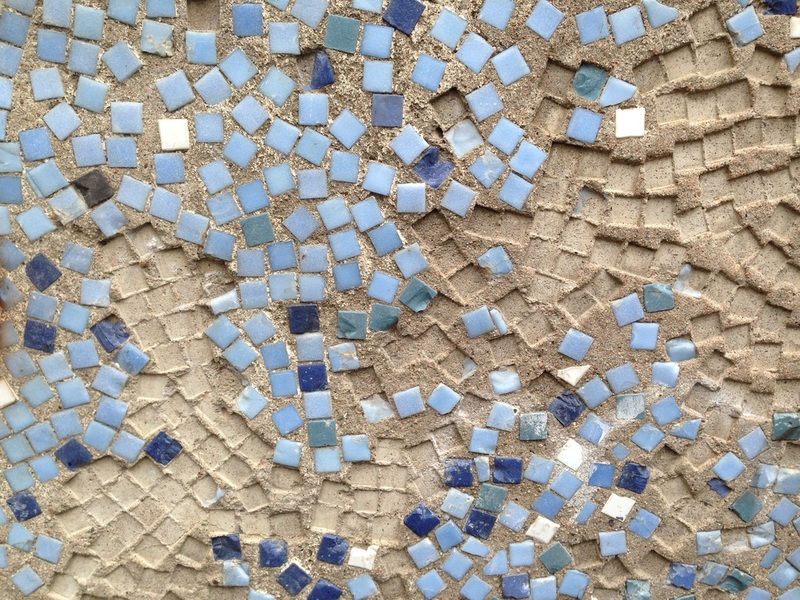 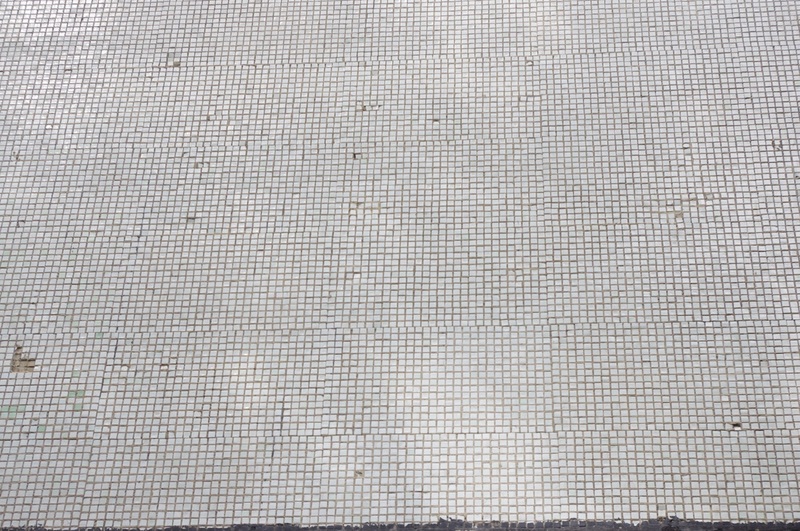 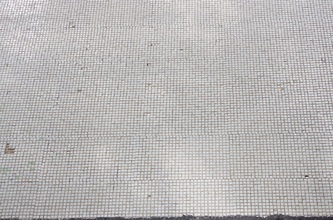 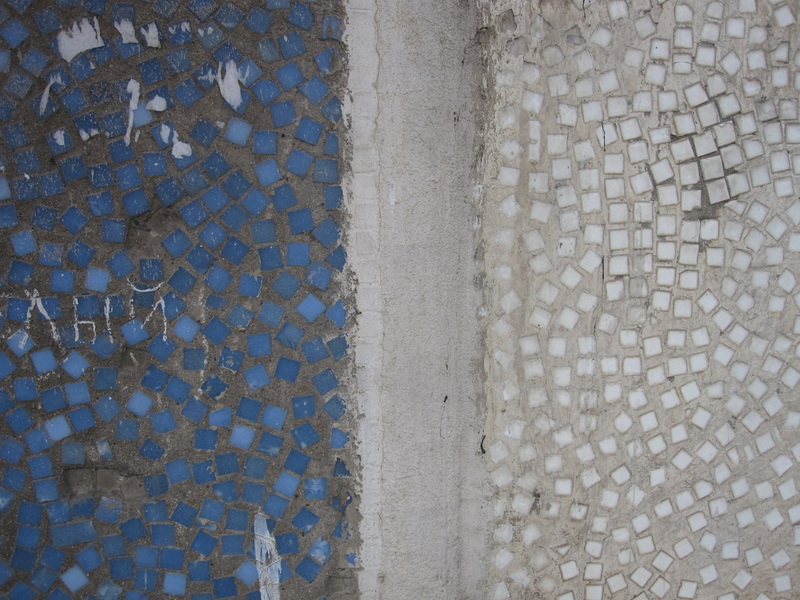 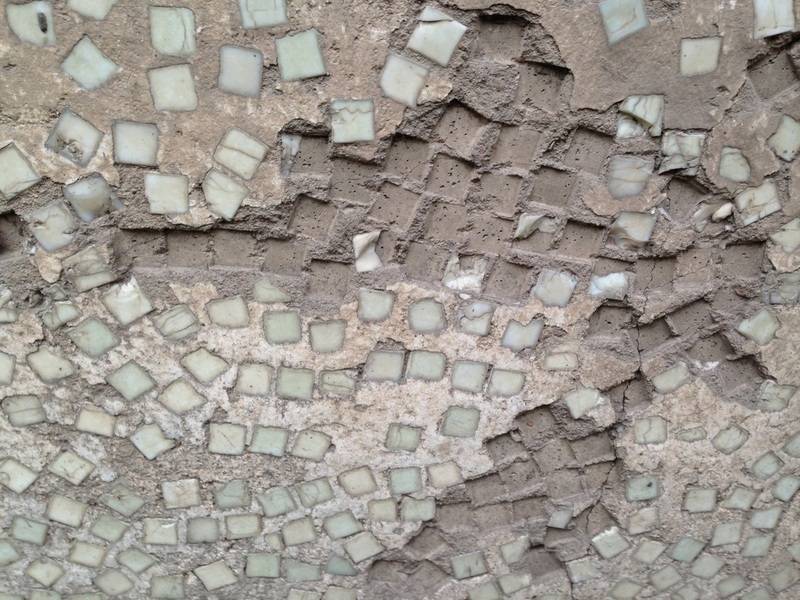 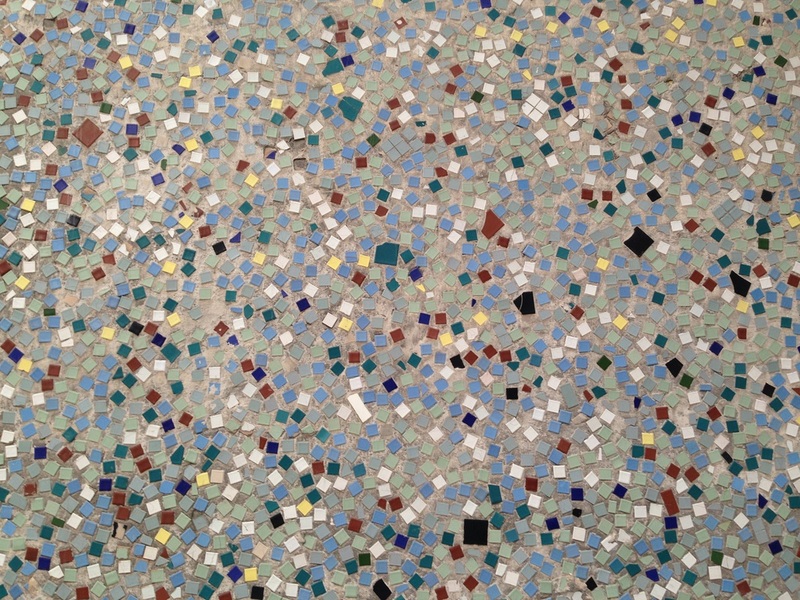 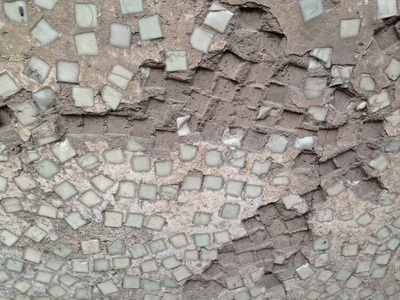 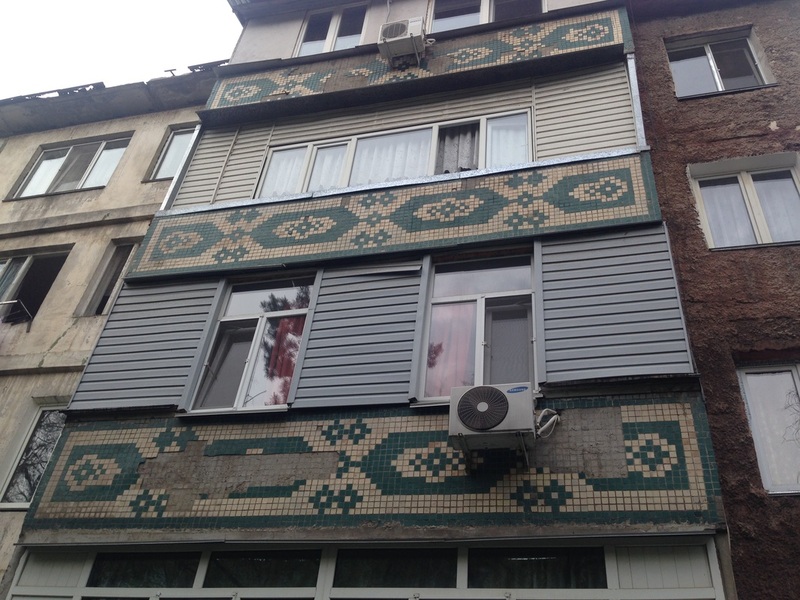 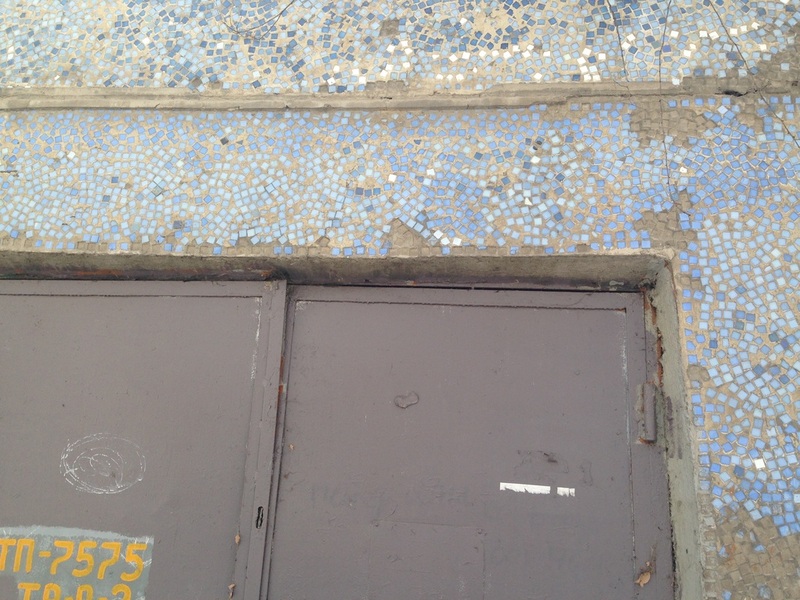 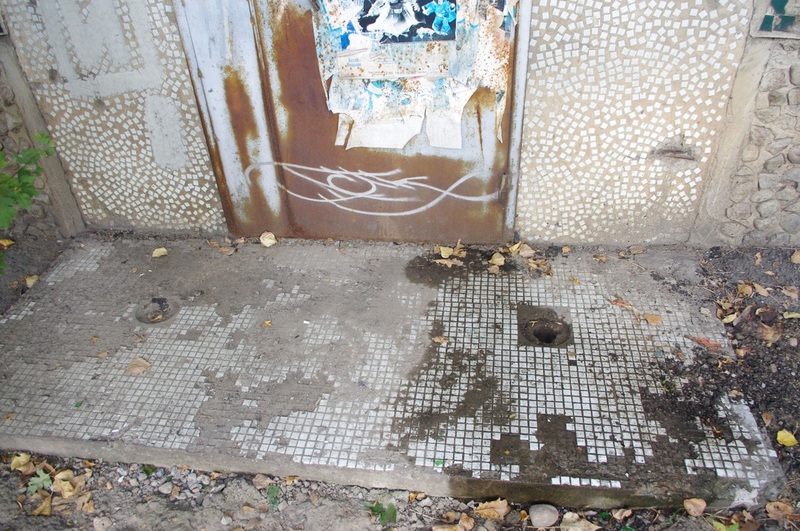 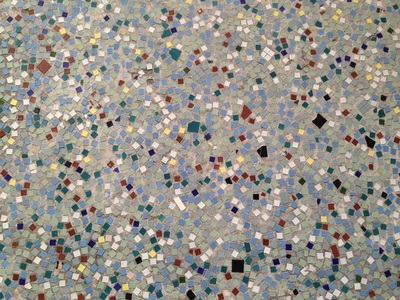 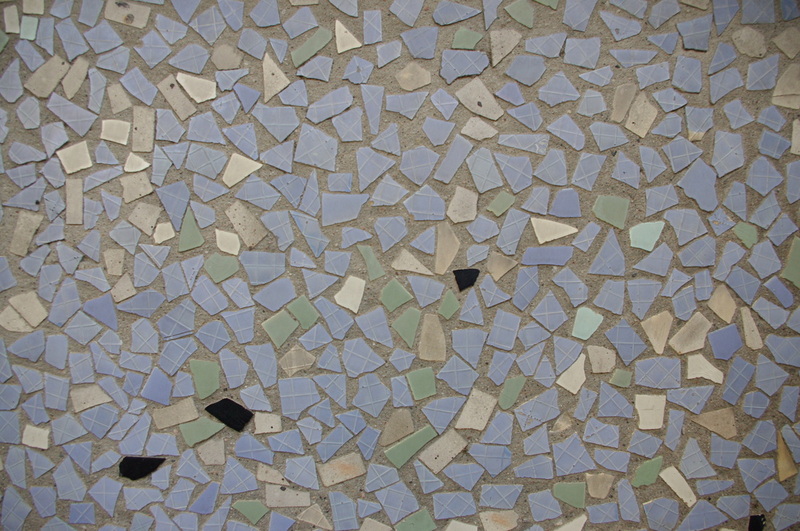 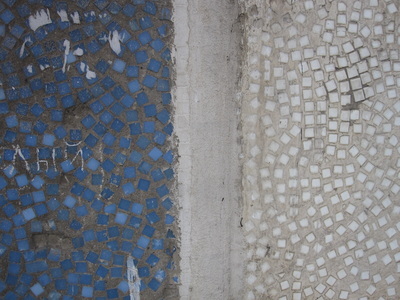 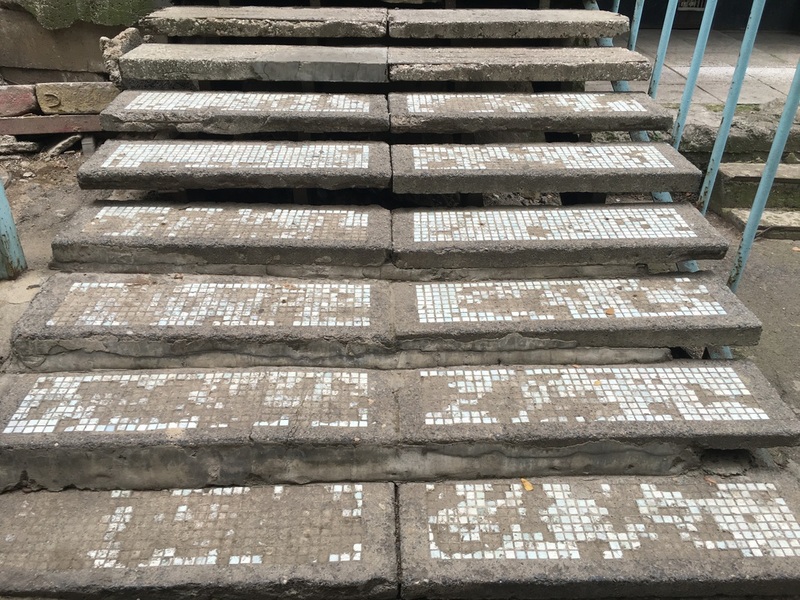 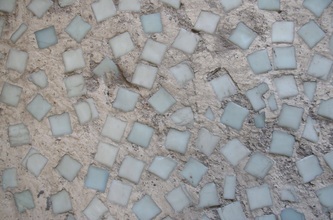 Thousands of little squares of the material were embedded into cement; from close-up the buildings look sloppily speckled, but from far away they shine light-blue. 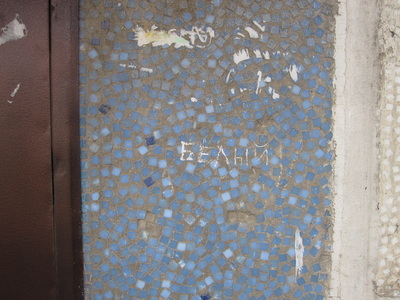 Smalta itself actually has a long Russian history. 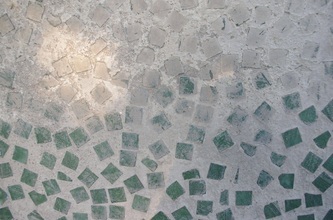 Mikhail Lomonosov, the 18th-century Russian polymath genius who discovered Venus, was studying color and optics when he stumbled upon a way to make glazed glass in hundreds of colors. 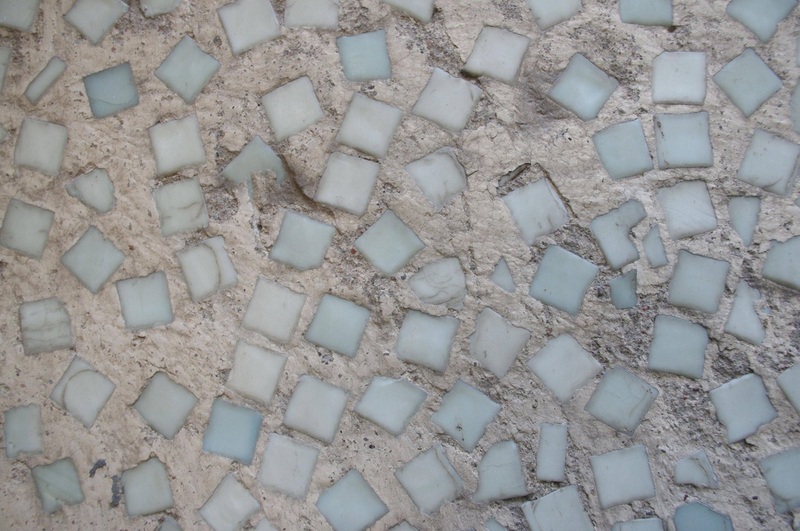 In 1753, he set up a whole factory to churn out this smalta, the first time such glass was made outside of Italy. 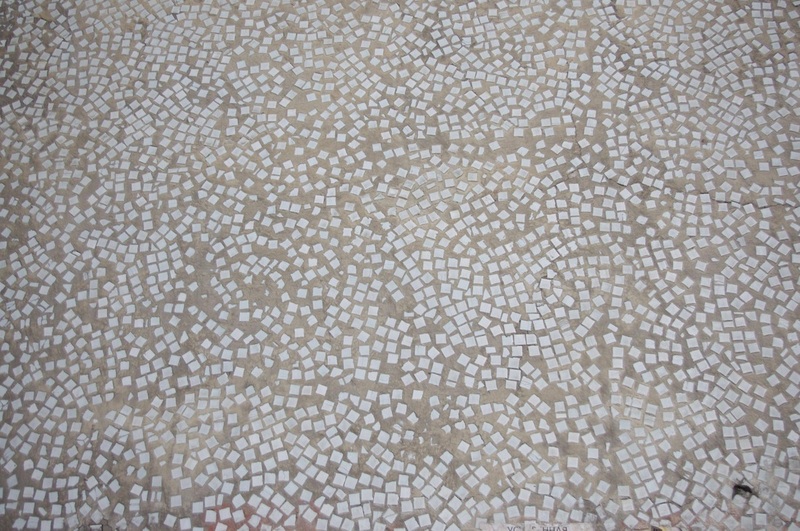 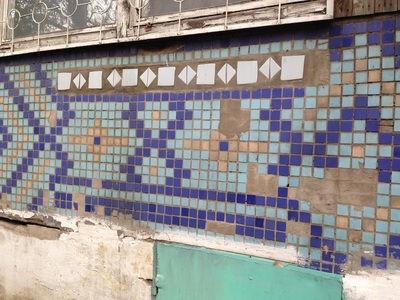 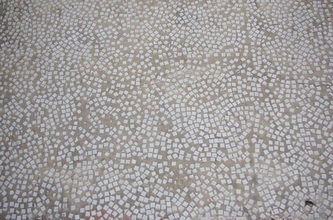 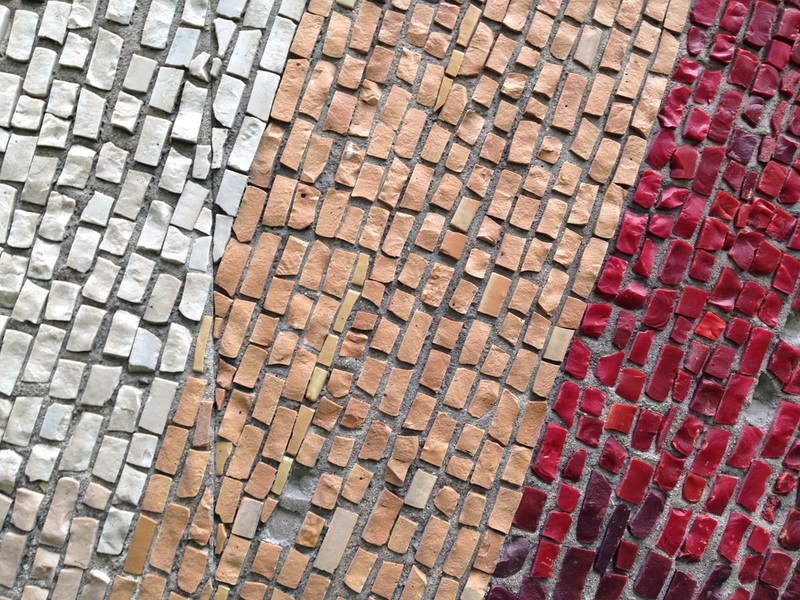 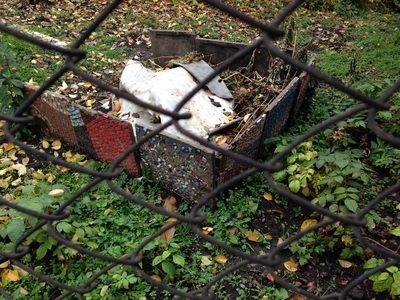 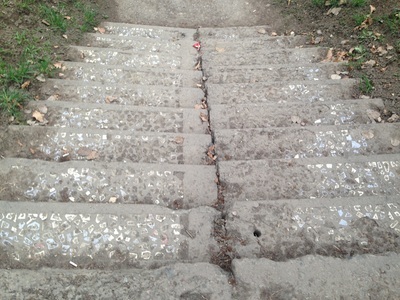 The mosaics made with this new technology were seen as a revival of a Russian orthodox tradition that had been lost in the medieval ages, and the knowledge of colored glass-making was passed down through generations of Russian artists until it reached its apogee in the massive mosaic machine of the Soviet Union. 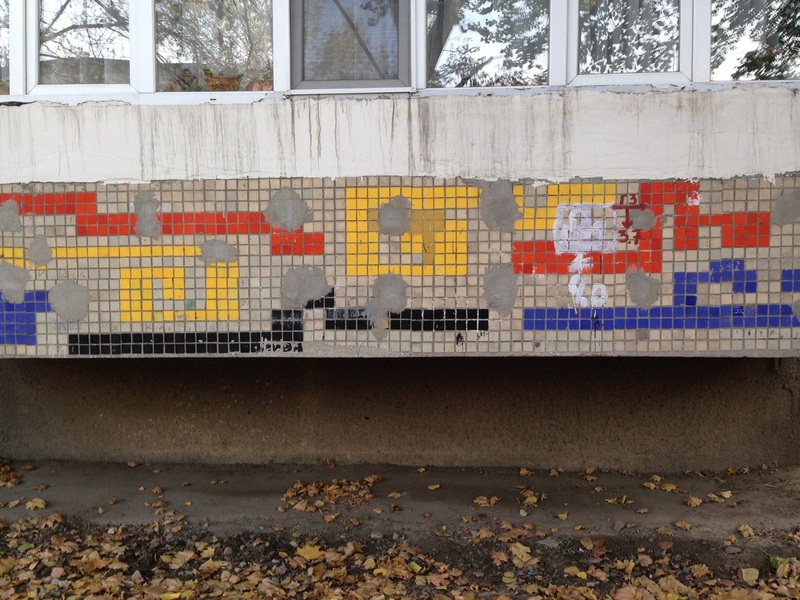 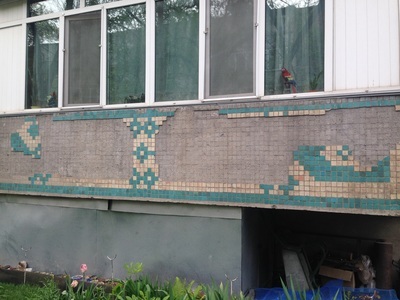 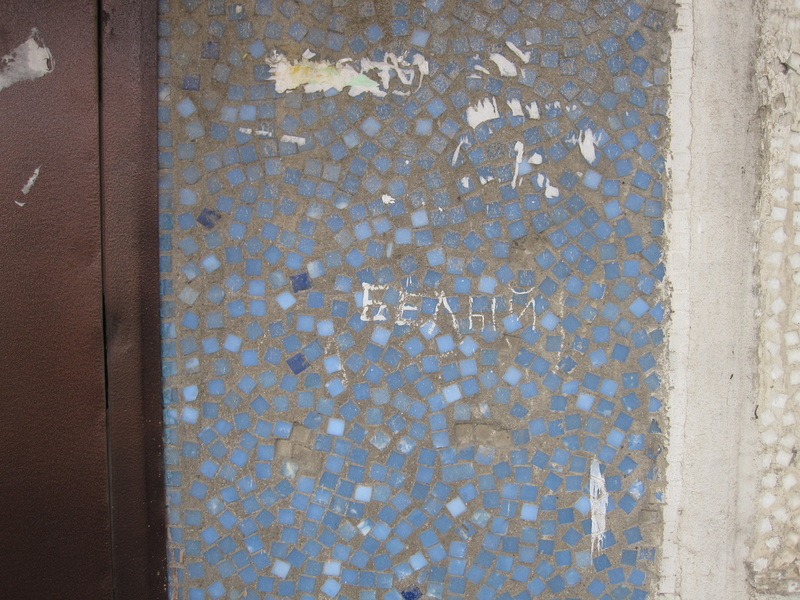 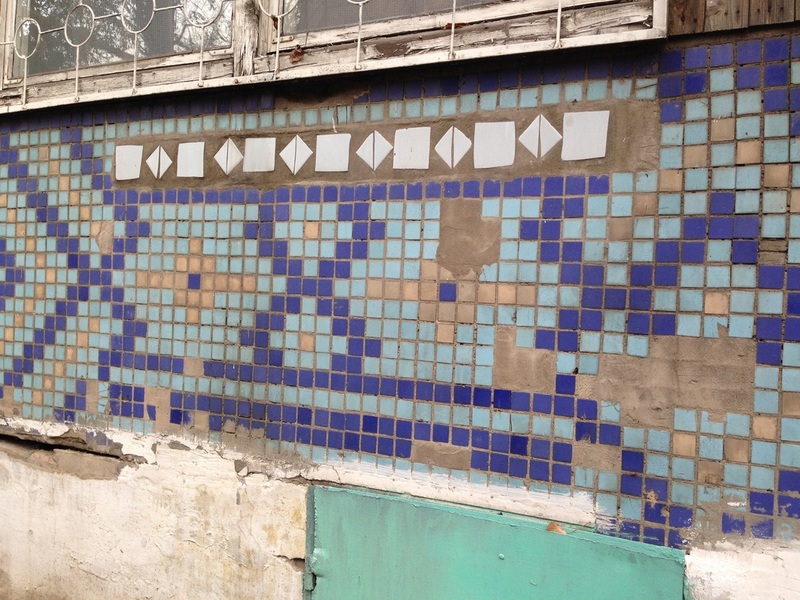 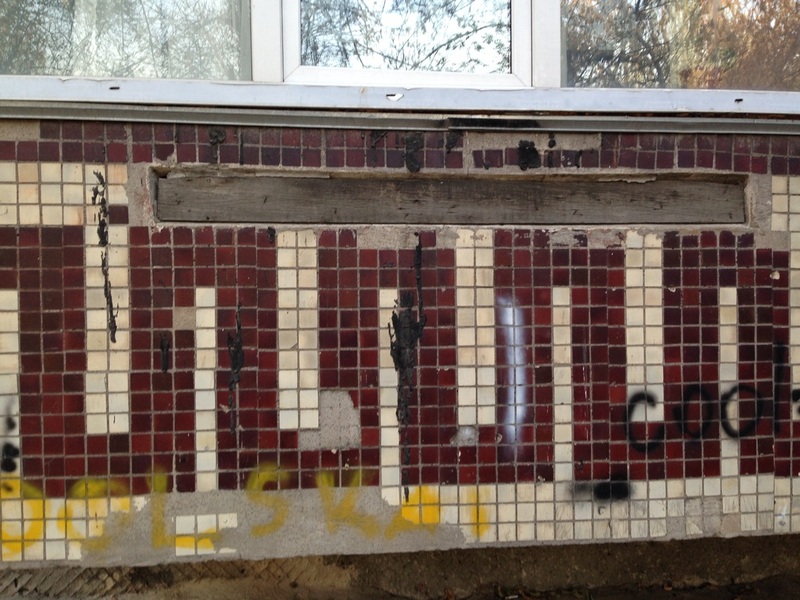 Soviet mosaics are rightfully noted for their stunning quality and quantity, but Lermontov would also be proud, I'm sure, to know that his discoveries in colored powders and how to cook them would transform the face of a Kazakh city two hundred years later.